On a recent trip we visited a Colorado goat dairy farm that let us spend the night on their farm because we are members of the Harvest Hosts program. As part of their farm tour I was able to milk a goat and pet baby goats which ended up with me buying a lot of fantastic goat cheese. They had a wonderful fresh blue cheese that reminded me of a recipe a co-worker used to bring to company pot lucks. The salad itself only has 5 ingredients that are all easy to pick up in almost any grocery store if you go with normal blue cheese. I like the goat blue cheese if you can find it. If you don't want to make your own dressing you could use a Raspberry Vinaigrette or a bottled Poppy Seed dressing. Any sweet dressing would work well. To make the dressing start with a jar with a tight fitting lid. Combine the vegetable oil, vinegar, sugar, lemon juice, poppy seeds, salt and mustard powder. Shake well until sugar and salt are dissolved and everything is well combined. 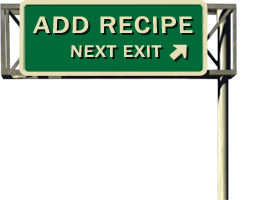 Make this ahead. It keeps for weeks in the refrigerator. 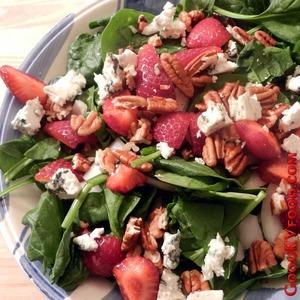 Just before serving combine spinach, strawberries, pecans and sweet onion in a large bowl. Crumble blue cheese over the top, add dressing and toss to coat.